CRIT's efforts to curb meth use on the reservation have received a couple of significant boosts. Governor Janet Napolitano's Office of Children, Youth & Families has awarded CRIT a $20,000 “Phase I” grant to help Tribal efforts to combat meth use, including providing funding for education and planning for CRIT staff members whose jobs include fighting drugs on the reservation. The grant is part of a partnership between the Governor's Office and Tribal and government agencies throughout the state to combat meth use. Additionally, CRIT has put together a Tribal Meth Coalition, with the goal of coordinating efforts between Tribal departments and other agencies to fight the spread of meth use and manufacturing. Councilwoman Cindy Homer spearheaded the effort to establish the coalition, which includes several key Tribal departments, Tribal council members and Tribal leaders such as Miss CRIT, Susan Ann Welsh. David Harper, CRIT Alcohol and Substance Abuse Program Manager, said that the goal of the group is to find ways to deal with the meth problem in the community. He said that the group decided from the beginning that education of CRIT youth was going to be a key to their success. “We decided we need to look at young kids in school and educate them about the dangers of meth use,” Harper said. Harper said that for example, CRIT has a high rate of mothers and babies testing positive for meth use right at birth. “We will be developing educational programs to tell parents about the dangers of meth use as well,” he said. 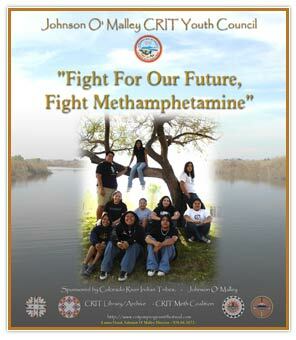 The Tribal Meth Coalition meets on the last Monday of each month at noon at the CRIT Substance Abuse Program Office. The meetings are open to the public. CRIT's efforts to establish a family drug court are also continuing. The family drug court would provide another option for CRIT in its efforts to deal with meth use and other drug use. Its purpose would be to facilitate the efforts of families to recover from the impacts of drug use and ensure participation in rehabilitation programs. CRIT recently received a planning grant that will pay for training for eight CRIT staff members so that they have the expertise needed to start the court and oversee its operations. The next step, besides participating in the training sessions, is to apply for an “implementation grant,” which would fund the actual start-up of the family drug court. A notice that applications are being accepted for the implementation grant should be posted in the next couple of months.